Innovation projects are full of uncertainty, and with uncertainty comes risk. Innovation projects are influenced by internal and external events that create different types of risks during the execution and delivery of the project. While the there are no risk-free projects, an effective management of the project’s uncertainty and risk enhances the success rate of the innovation project. Project Risk management is not about eliminating risk but about identifying, evaluating, and managing risk. Our team has identified multiple tools and best practices to manage risk in innovation projects. One technique that is easy to implement and is familiar to technical teams is the concept of Risk Failure Mode Analysis. RFMEA leverages the Failure Mode and Effect Analysis engineering quality methodology and it applies it to identify and counter innovation project risks. 1 – Risk Identification – Identify key risks for the project. Grouping risks around a function or a project stage helps having a more detailed risk management. There can grouped by Design Risks, Project Risks, Technology Risks, Commercialization Risks, each project will have different types of risks, such us cost, schedule, resources, capability, etc. 3 – Risk Priority Number – To calculate the risk priority number we assign a detection factor for each risk. The detection factor is the ability to anticipate its occurrence. 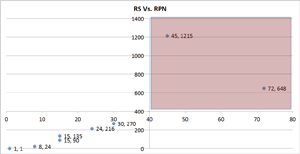 We calculate the RPN for a risk by multiplying the Risk Score by the detection factor. We can provide values from 1-10 to the detection factor. 4 – Risk Management Plan – Finally we can develop a risk management plans for the major project risks identified above. With the plans at hand we can now revise the RS and RPN values of these risks. With both the RS and RPN calculated we can plot the results of each risk on a scatter diagram and visually manage the effects of the Risk Management Plan on the program risks. As better plans are incorporated risks should move from the top right hand corner to less risky locations on the diagram. Only high-risk projects are more likely to have a risk management plan. The risk management plans have high effects on project schedules and cost. The integration of risk management early in the Innovation project life cycle enables more time for managers to mitigate them. The quantification of risks through project risk groups contributes to greater reduction of project uncertainty.